Del Mar Avionics is a leading manufacturer of high technology, precision products that are marketed and supported worldwide through its Industrial and Defense Systems Divisions. The company was originally established in 1952 as Del Mar Engineering Laboratories by Bruce Del Mar, who led the development of aircraft cabin pressurization systems, helping make possible todayâ��s commercial aircraft industry. By the mid-1960s, the company had become a leading U.S. Defense Department prime contractor in the development and production of aerial tow target systems for weapons training, and instrumented ground targets for scoring air-to-ground automatic weapons delivery. It also produced helicopter target drones and helicopter flight trainers for the U.S. Army. In 1965, the company introduced the Hydra Set Load Positioner that controls the precise vertical positioning of loads up to 300 tons (272,000 kg) in increments as small as 0.001 inch (0.025mm). This unique product, mounted between the load and the crane (or hoist), permits precise mating and de-mating of critical components, thus eliminating unforeseen damage to valuable loads. 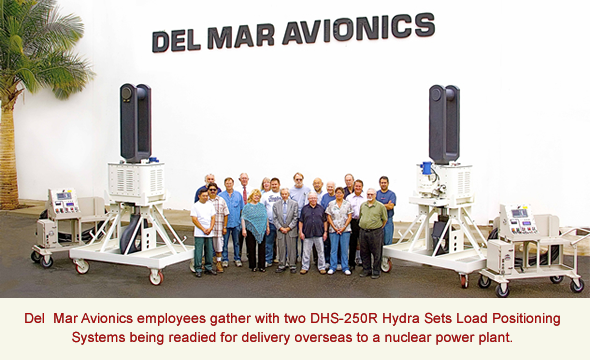 Thousands of Hydra Set Load Positioners are in use worldwide in the aerospace, military/commercial aviation, nuclear and fossil fuel power generating industries and in various industrial applications. After 60+ years in business Del Mar Avionics continues to exceed our customerâ��s expectations, including, but not limited to performance, reliability, safety and functionality. In addition, Del Mar Avionics will meet the requirements and regulations of all applicable government agencies. The true measure of quality at Del Mar Avionics is customer satisfaction. Customer satisfaction and the quality of our products and services are, and will continue to be, the keys to our success.